When you're outdoors, the cold can really get to you. Your feet get cold, your hands get cold… and before you know it, you've caught a chill and your trip is ruined. When you're fishing, you're also wet, which only adds to your misery. If you have a health condition on top of that, like neuropathy from diabetes, or arthritis that is aggravated by the cold, well… I'm sure you can imagine just how miserable you'll end up being. But how do you still enjoy your outdoor pastimes like fishing, hunting or climbing? We are so lucky to be able to use warmers. There are a few types to choose from, so you can use whichever type of warmer that appeals to you. Warmers are made specifically for feet, hands, and body use. They last for hours, and they keep you warm. This is especially needed if you have health conditions that are affected by the cold. The cold can restrict your circulation, increase your pain and stiffness, and cause frostbite and other damaging effects to your body. Warmers help fight these effects, and keep you comfortable and healthy while you enjoy the outdoors. The most well-known and experienced company producing chemical activated hand warmers, et.al, is Grabber Warmers. Their warmers are convenient and easy to use. You can get packs of hand warmers for use in your gloves and shoes to keep hands and feet warm. They are specially made of a combination of iron, cellulose, vermiculite, water, activated carbon, and salt. When this combination is exposed to air, it heats up through a chemical reaction in which the iron in the pouch oxidizes in response to the oxygen. This produces iron oxide (rust). The salt is the catalyst. Carbon helps disperse the heat, while the vermiculite is an insulator, helping to retain the heat. The cellulose is a filler. The propylene bag that contains all these ingredients allows air to permeate the bag, and holds in moisture. You can choose Grabber Hand Warmers, or any of their other products, in many different sizes for different uses. You can also choose the formulation that works for the amount of time needed. You can choose from 7 hour, 12 hour, 20 hour, and 40 hour durations. Small warmers are available for your hands and feet. You can also get foot-shaped warmer liners to put inside your shoes. Larger warmers can be adhered to the body to help maintain warmth. If you want non-chemical warmers, try on a pair of Heat Gloves or Heat Sox. These great products are battery powered. 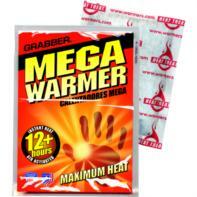 Grabber Hand Warmers are extremely useful for outdoor activities on those cold mornings, or trips through the snow. For people with circulatory problems, arthritis, diabetes, and other conditions like neuralgia, injuries, and Raynaud's syndrome, these warmers can mean the difference between having to remain stuck in the house and being able to enjoy the great outdoors. Grabber hand Warmers as well as their toe, body, foot,etc. warmers are disposable and can be purchased singly, in kits, packs, and by the case. They are small enough to keep a stash in the car, boat, or in a pocket of your fishing vest. You'll be amazed at how toasty you'll feel even in sub-zero temperatures when you use Grabber Warmers. If you prefer re-usable warmers, take a look at MPI Outdoor Products. They offer emergency and all-weather blankets and battery-warmed socks, mittens, and gloves. All of these items are useful when you're enjoying the outdoors, and will help keep your circulation going and relieve pain caused by the cold. Heat Sox are knitted from a combination of 50% Thermastat, 30% wool, 14% nylon and 5% acrylic yarn. The socks are soft, warm, and comfortable. A battery pack is added at the top of the sock to hold a "D" battery. Snap the pouch closed, and the battery is activated to provide your choice of high or low heat. It is recommended to remove the battery when not in use. The element that provides the heat is located in the enclosed region of the bottom of the toe. This area is padded and protected. It keeps feet toasty warm and comfortable. The wires are run through a fabric channel, and do not produce any heat. There is no danger of shock or burns, even when the sock gets wet. Battery life is about 10 hours on high, and 12 hours on low. Heat Mitts are made of Thinsulate, and are powered by 4 "AA" batteries. An easy to operate on/off switch lets you select high or low heat. The heating elements are built into the back of the hand area, in a protected, padded region, to warm your hands and increase your circulation. You can use the mittens with the heat turned off as well. They are comfortable, insulated, and have non-slip fabric on the palm. Cuffs can be adjusted for a tight fit to keep out the cold. Battery life is about 6 hours on high, and 8 hours on low. 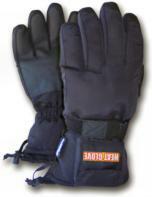 Heat Gloves are also made from Thinsulate and feature a heating element powered by 4 "AA" batteries. Fully insulated, these gloves are nice and warm with or without the batteries, but if you need the extra heat, you can choose from high and low settings, depending on your situation. The cuffs can be tightened against the cold weather. All gloves are field-tested, so you know you are getting a quality product. These re-usable items are perfect for people who need that extra warmth in the outdoors. Older people with circulatory problems or arthritis will appreciate them, as will those who suffer from diabetic neuropathy, or other ailments that are cold-sensitive. Give them a try the next time you want to be outdoors in the fall or winter. You'll be amazed at how much more you'll enjoy your time, whether you're fishing, working in the yard, or taking care of chores. As with hand warmers or any products such as those described above, it is highly recommended that you read and follow the manufacturer's directions for use. People with neuropathies should be especially aware of potential problems due to the fact of skin insensitivity. Those individuals will not be able to feel the heat as well as people without neuropathies. Therefore, extra precautions should be taken to alleviate the possibility of burns. Otherwise, take those hand warmers, etc. out of their bag, and go have a great time out there! !